Corner stones are stone, stucco simulating stone, or contrasting bricks, in a header and stretcher pattern, at the outside corner of a wall at a change of elevation or at a window or door. Corner stones are often referred to as 'quoins', from the French 'coin', meaning 'angle'. Earlier in the period, corner stones were often of stone, or stucco detailing. If the walls themselves were brick, they served more as a cosmetic feature but in the case of a rubble or flint wall, they had a structural role. 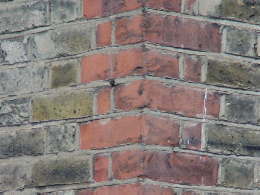 In this example (right), from an 1860's church, stone corner stones are used with both brick and flint. Terracotta bricks were occasionally used with brick walls after 1900.